Pink is coming! Such a welcome colour, and late to the party this year. Saturday afternoon was the day set for an early celebration of Tim's birthday. The Vancouver couple were over for the weekend, but one of the local families was out with the Norwalk virus and they declined spreading it to the rest of us. We missed them, but were happy to miss the virus. The sun shone in between clouds. A chilly wind bent the grasses and crawled along our necks. But once we got going, we warmed up. 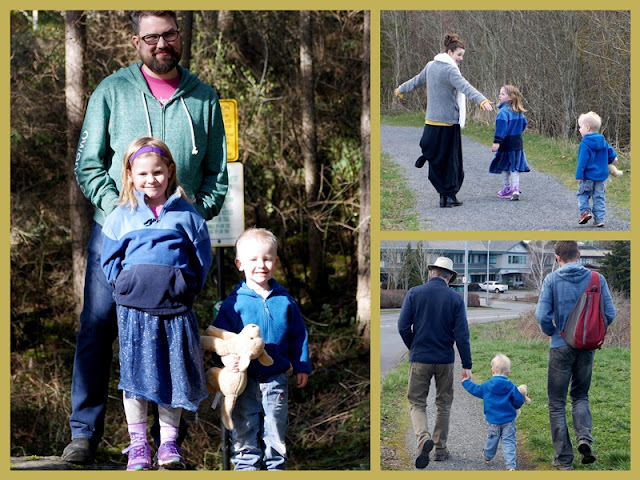 Auntie and Uncle are a big hit with the littles. 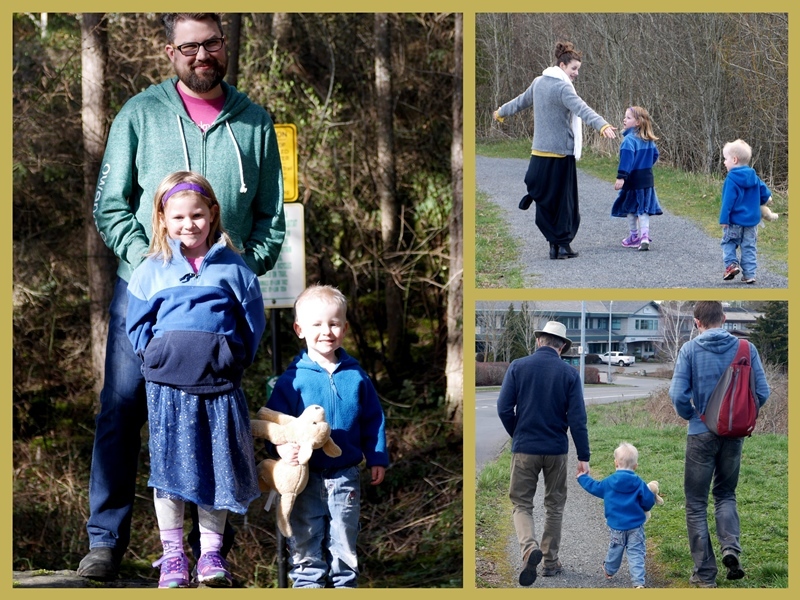 In the bottom corner, a three-generation photo with Mister F's short legs stretching as far as possible to keep up with Daddy and Grandpa. Bird life on the Bog. 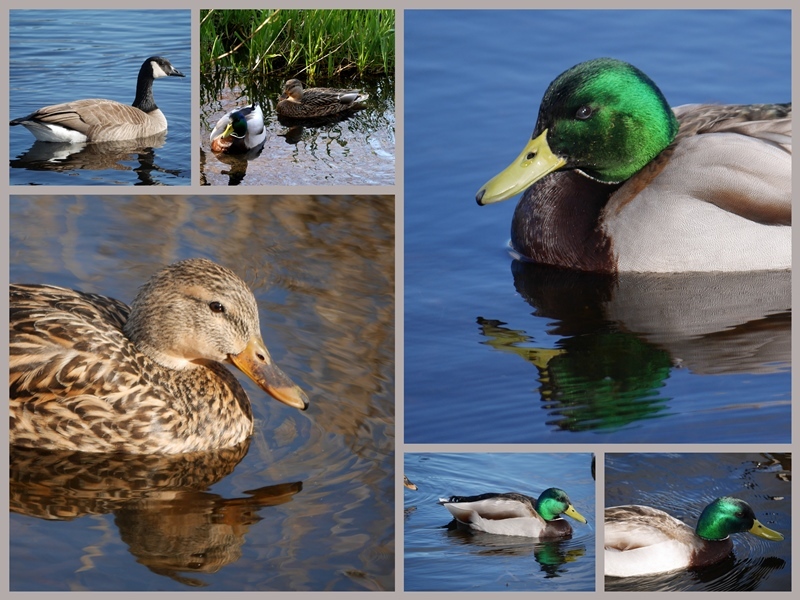 Mallards, geese, coots, and more. There's not a lot of green yet, but the colours and shadows caught my eye and I took this photo. When I looked at it on the computer, I noticed, for the first time, the blue heron against the rushes. Can you spot him? Zoomed in a little closer. He certainly blends into the background. Tim's birthday isn't until the end of the month, but this date worked best (or we thought it would) and so we celebrated this wonderful man is dearly loved. Home again for Chinese food, followed by a massive cake. Since I wasn't cooking the main meal, I thought I'd put a little more effort into the cake. An Ultimate Sampler cake, inspired by Sprinkle Bakes. After making her cherry cake and the humming bird cake layers, I switched to my own recipes. The top layer is Chocolate Mousse, which is frozen ahead in order to assemble the cake. The baking all went well, the assembling, not so well. A disaster with the frosting had me racing to the store for ingredients and changing to my own recipe again. It was a fun experiment, but I'm not that impressed with the results. I think one or two flavours in a cake are plenty, no need for more. And it's massive. We didn't even eat 1/4 of the cake. I've frozen it in chunks (after scraping the mousse off) and we'll be eating it for a long time. Cake, anyone? That 5 layer birthday cake is so pretty and very impressive! And your capturing of the blue heron among the rushes is wonderful, but I have to say that the shot of those 3 males walking together ahead of you is my favorite, the sweetest thing even though it is so masculine! That is truly an amazing cake, but I can imagine that it would be hard to get through being so enormous! The photo of the reeds in the water is so beautiful, and the heron too. What lovely sights there are if we just look. Yes, please! What a cake! (Had I been there, you wouldn't have needed to freeze anything...) Your husband and the grandchildren look very happy. Birthday greetings to your husband and Happy Spring to you all. 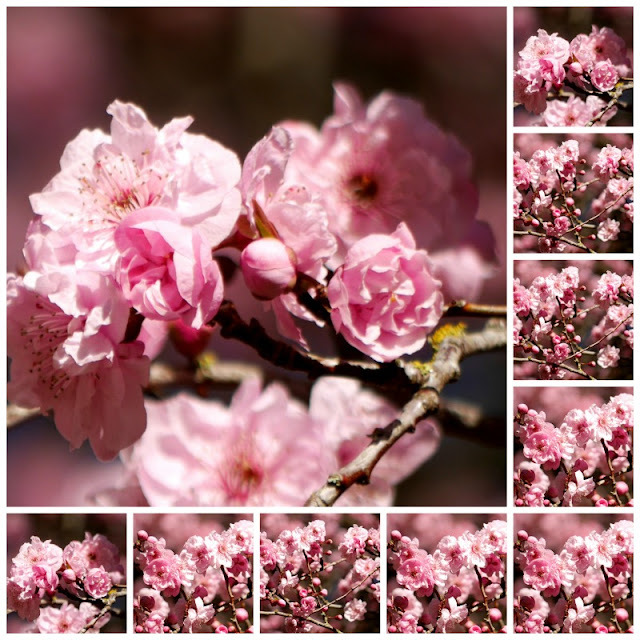 Perhaps the yellow of your previous post says spring best, but pink is a gorgeous spring colour too. Lovely flowers! PS I learned something today. The name Norwalk virus made me curious. We call it norovirus. It circulates also here, especially unpleasant this winter. It's nice to get out for a walk in the spring air after being cooped up for the winter. It looks like you all had a fun time. Those herons really do hide well and blend right in! Your cake looks amazing. I could have eaten the chocolate mouse part for you. :) Happy Birthday to Tim! The cake does look amazing and quite a feat to put it all together and keep it that way. Glad you had some family to celebrate with. Seems the flu is just hanging around way too long. What a lovely, lovely birthday cake and those are all great pictures! You did a wonderful job pulling that off!!!! I love your photos and it looks like a great family gathering. That cake looks fabulous and how thrilling it must have been bringing it to the table. I would love a taste right now. The pink and bird mosaics are lovely. I'd love a slice of your cake sampler! Happy Birthday to your hubby! I think that cake looks amazingly delicious! What a wonderful celebration with family. And those blossoms, oh my goodness! They also look delicious! Such sweet pictures of your family. Thank you for sharing them with us. Wow! That is an impressive cake, and it certainly looks festive, even if it won't have an encore! Oh, heavens. The Norwalk virus. No one wants that birthday gift. Hope the sufferers are well on their way to recovery! Your "pink" mosaic is stunning. Such beauty! I think we are through our drought here so we are starting to green up here which is kind of nice after four or five years of no rain. Love the wildlife. Your cake has inspired me. We always have a big difference of opinion of what flavor cake to have. I am stealing this idea. Happy Birthday to your hubby, Lorrie! All the best! Such lovely mosaics of your family gathering for such a special occasion. The bog birds are beautiful; they look so pleased, just swimming about their routine. And yes, I did spot the blue heron, despite its clever camouflage! Your birthday cake looks and sounds scrumptious. Like you, I prefer two flavours, tops, in a cake, but your collection, I must say looks tasty. What beautiful photos, as always, Lorrie, and a very Happy Birthday to your dear hubby! What an impressive cake you made. I'm sorry that it didn't meet your expectations, but I'd love a slice! Feliz cumpleaños a Tim, and bravo for your intrepid cake-making scheme. It looks quite impressive, even if it didn't match your expectations. And I'm unabashedly envious of your homegrown lemons. I wouldn't say no to a slice of the great looking 5 layer cake, what a wonderful treat for your husband and your guests. Great to have your company, as always, for MM. Love your pictures, Lorrie! Thanks so much for your kind words. You are a blessing and I am grateful. Happy Birthday to your husband! 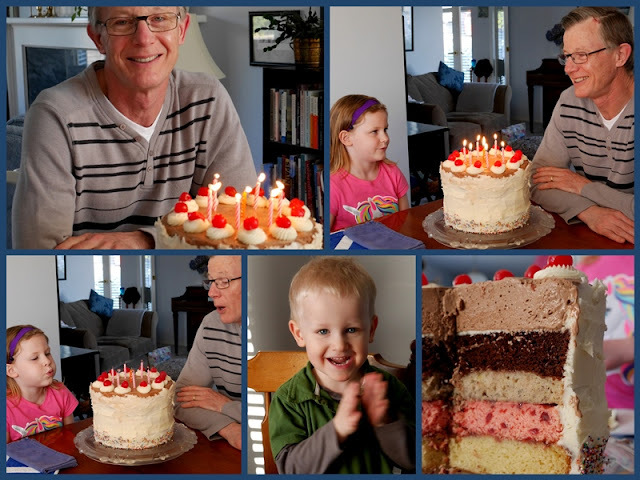 Such lovely photos in this post, Lorrie....your cake is amazing! I am so impressed by those multi layered cakes, and yours looks perfect. It is a good idea to freeze sections of it to enjoy later. We often have too much birthday cake left over too! Love the pink blossoms...just beautiful. Don't you love little surprises in your photos? The sun is shining in Ontario and we're warming up (well, except for tomorrow) and I am itching to start cleaning up the gardens. Can't wait for our blossoming trees! That was one big cake you make for your hubby, a lot of work but very nice inside. I have to laugh because we finished up the cup cakes that I baked for our daughter's Christmas Eve birthday. They froze very well and tasted fresh. Frosting, too. Your cake was an adventure and now you know. The pink blooms are beautiful. Our trees have not yet blossomed and 1 lone daffodil has opened. Still a wee bit chilly here, too. That cake is a labor of love. MMMMMMM. Loved the photos in your post! I love your photos. You take shots that I would, I think! As for the cake, it's truly the thought that counts. And having some in the freezer for another day isn't a bad thing! It looks like a wonderful and very yummy celebration. What a fun surprise to capture the blue heron without knowing. Now that cake is something else. Fabulous. Love the pink blossoms. Hoping to see some soon!